Respected hotel restaurant known for its seafood, sushi and views. 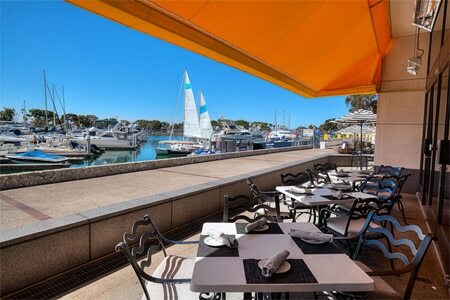 : Sally's is an upscale, contemporary restaurant with one of the better waterfront patios on the marina --- it's ideal for sunset cocktails and sushi. Chef de cuisine Jake Andrews, who joined the team from Waikiki, carries on the focus on sustainable fresh seafood. We like the crispy, meaty crab cakes, crafted with lots of lump crab and very little filler. Or consider some specialty entrées like the lobster paella with squid, mussels, bay scallops, octopus and Spanish chorizo. Become part of the culinary experience by reserving the chef's table (seats max 12) located inside the kitchen.